Suggestions to expand this list below. If you have time, consider giving an explanation as to why a specific card would need a special tracker - after all, every card technically creates a "game effect" - because not all cards actually need them, either because they physically perform their game effect (for example, most jobs, because they stay on the table while being resolved), or the play time that passes is too short to justify a memory marker (for example, Benjamin Washington because the pre-game Grifter phase and the first Upkeep are so close together). As there are plenty of effects that make a dude a stud, why not just have a generic 'Stud' counter? I've found that for dudes who don't boot to use their abilities, an 'Ability Used' counter is often useful to have. Abram's Crusaders could generate a 'Deputy' counter. Buffalo Emporium is another one. Shifu Speaks gives a turn-long bonus to Kung Fu and Influence, so that probably warrants one. There has been an unintended development! Pinebox has (accidentally) solved the problem of the metal tins' snagging of sleeved cards: Bottlecaps! So, when I retired my deck to it's Sloane tin, I put one Unprepared token in the front, and one Raven token in the back. And after flying home and unpacking my stuff, discovered that my deck was easy to retrieve from the tin because the Bottlecaps prevented the front/back cards from getting snagged!!! Pinebox, any way we can order these directly? Would you consider selling singles? Thanks for the feedback @jordan_caldwell! The caps and mat from the event will go on our new online store, which we plan to lunch shortly after the pledge manager from the TCaR goes live. We will explore the idea of singles. Will other promos be available to the rest of us in any way? There are advantages and disadvantages of playing almost all games on OCTGN. The 'ability used' counter is automatic and extremely useful in OCTGN. Then, when I play physical games, I'm not used to having to remember if an ability is used so I am often unsure, especially when it comes to opponents cards. Having an 'ability used' token would be awesome! I don't suppose there's anyway the caps could be added on to pledges for TCaR in the pledge manager? The caps will be part of the merchandise featured on our online store and for sale at in person events. Unfortunately this is completely separate from the TCaR Kickstarter. Cool. Another reason to seek you out at Origins! I mean, I was going to anyway, but this way you can relieve me of some legal tender. This is the updated list from PAX Unplugged 2018 for Bottlecap Series 2.0. There are about a dozen of each bags going up on the website soon ($15 each). Up on the shop now! Them: "What is that? It looks cool. Is it a new beer?" You: "No silly. It's a Grim Servant of Death token!" As good an idea as the bottle caps are, there's not enough variety for them to be worth the cost of shipping to the UK. I'm thinking of just printing my own and having them pressed into badges, in the long run a more flexible and better value for money way to do it than ordering the bottle caps. Unfortunately that would be the only way to lower the shipping costs. Please keep in mind the images used are under official license. Hi again. 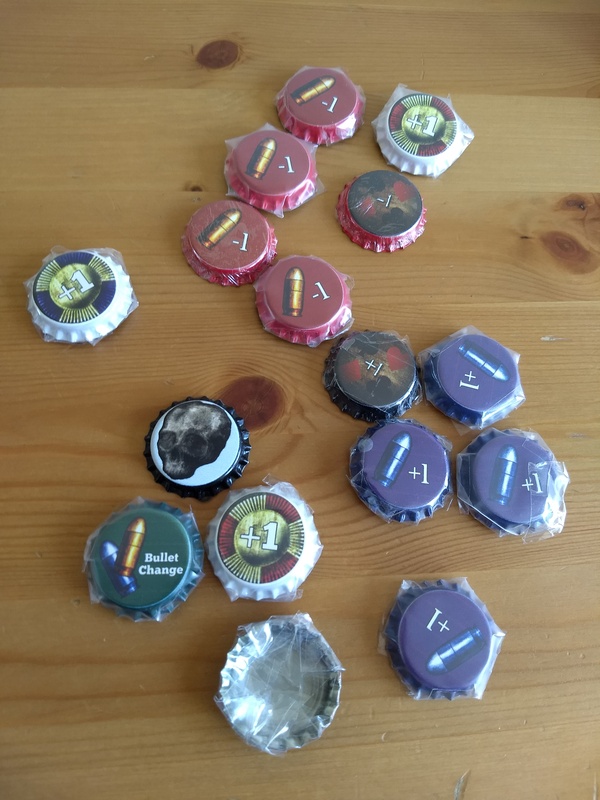 I just wanted to say that in the end I've bitten the bullet, as it were, and bought both sets of the bottle tops caps. Can I ask a question, while I have your attention? The concept and presentation if DTR is too notch and the community is solid, it's just that the cards having a linen finish means they scratch the print off quickly. Would it not be practical to use a smooth finish? An example that comes to mind is London 2nd edition from osprey games who re-issue their linen stock as smooth surfaces. The effect us actually much nicer. I think it would be like the Pokemon cards as well. So an update on the bottletops. I ordered with sets. Postage was $20 US and then I had to pay another £14 GB To pick them up from the post office: £6 import duty and £8 post office handling fee. The tops are excellent. I've covered them with plastic to keep them in good condition because I won't be able to afford more for a loooooong time. Good idea though. I'll be interested to see if there's going to be other sets. Fine idea on the plastic covering. There's another set with action markers (Bottle Cap series 2.0 listed by Pinebox above - Sun in Yer Eyes tokens etc). Ouch on the import costs! I know a bunch of people picked the bottle caps up direct from Pinebox at Worlds 2018, but that isn't a solution for everyone, but such indulgences are more bearable on luxury items at least (rather than eating this kind of charge on essentials like the cards themselves). They're far from mandatory, but we used the fancy tokens this week and found them both fun and useful. I bought both sets of caps and I've since unwrapped them (why?!! it took ages to wrap them!) and put them in card holder pages which hold 9 cards per A4 page. This way it is easier and quicker to find the token you need plus I get to hold the token! I was worried about them getting scratched but if they stay in the sheets then they only get taken out when they're in use. btw - i think there is a - draw bullet and + stud bullet counter. it doesn't matter because we just use the + and - for either type of bullet.